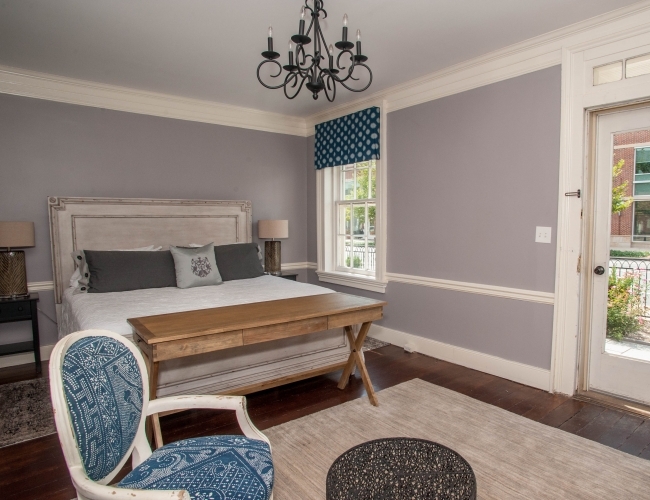 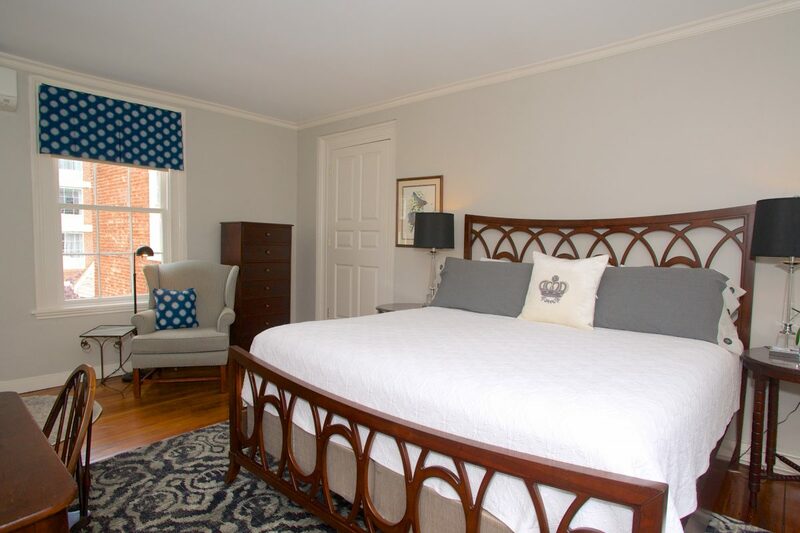 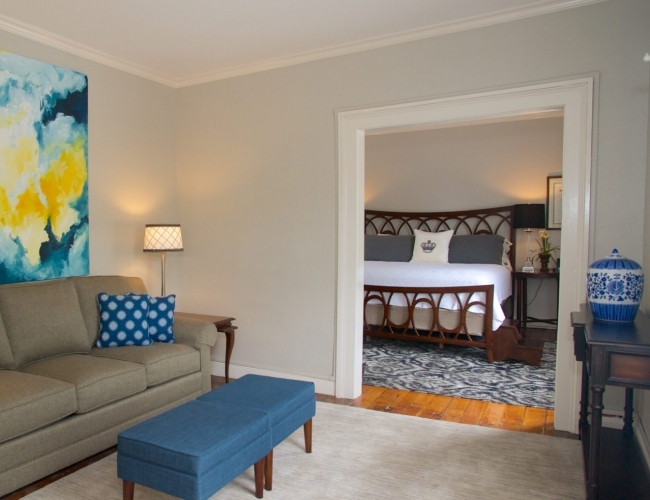 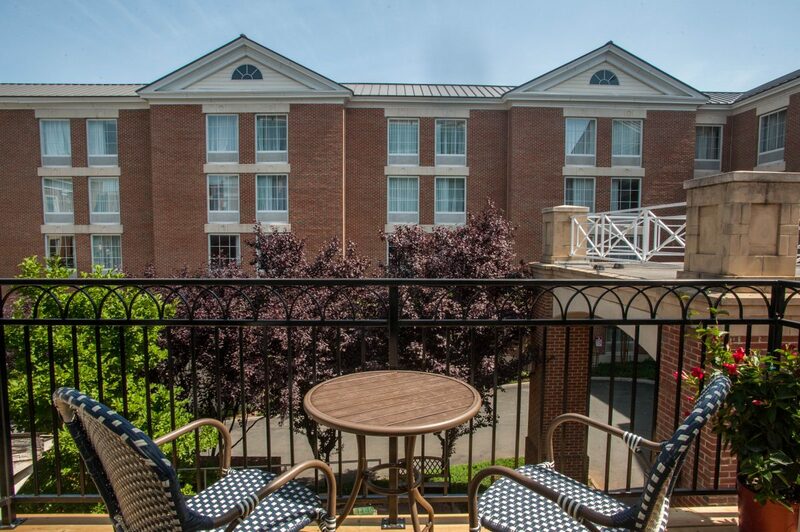 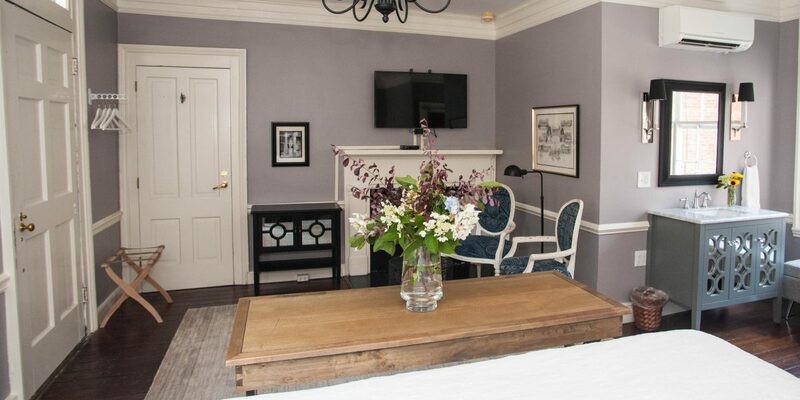 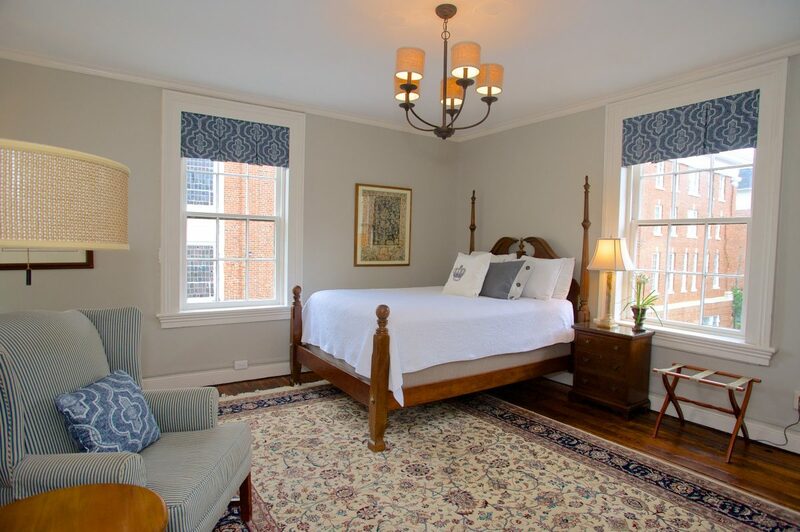 The Dinsmore Boutique Inn in Charlottesville, Virginia offers nine guest rooms, each tastefully decorated, with a combination of antiques and contemporary furniture, designed for your comfort. 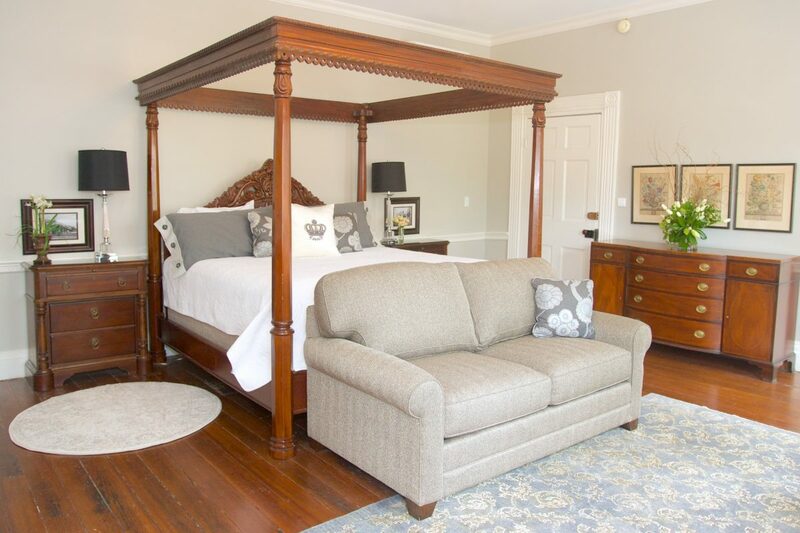 Each overnight guest at the Dinsmore receives complimentary BRUNCH at Farm Bell Kitchen (alcoholic beverages not included). 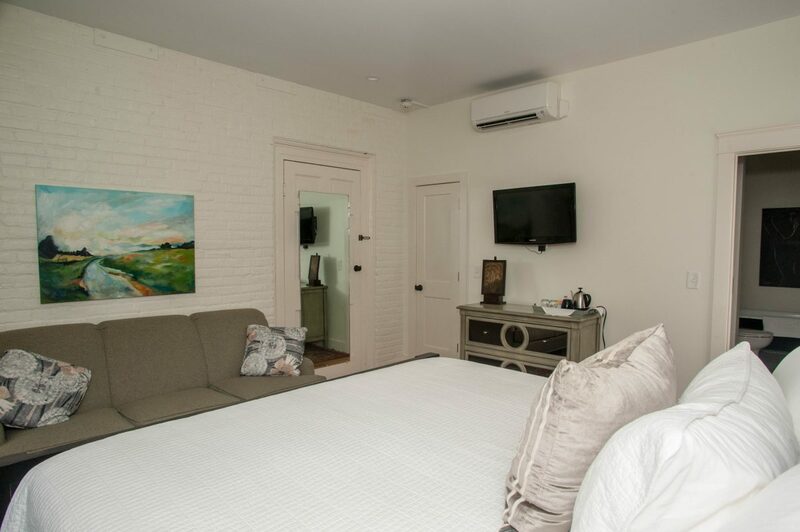 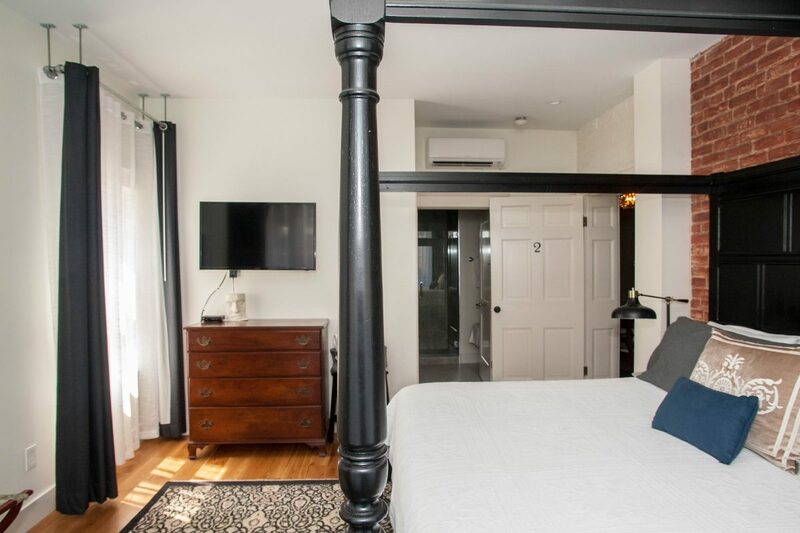 All of our guest rooms have a private bathroom, and each room has guest-controlled air conditioning, heat and the modern amenities you expect in a boutique inn. 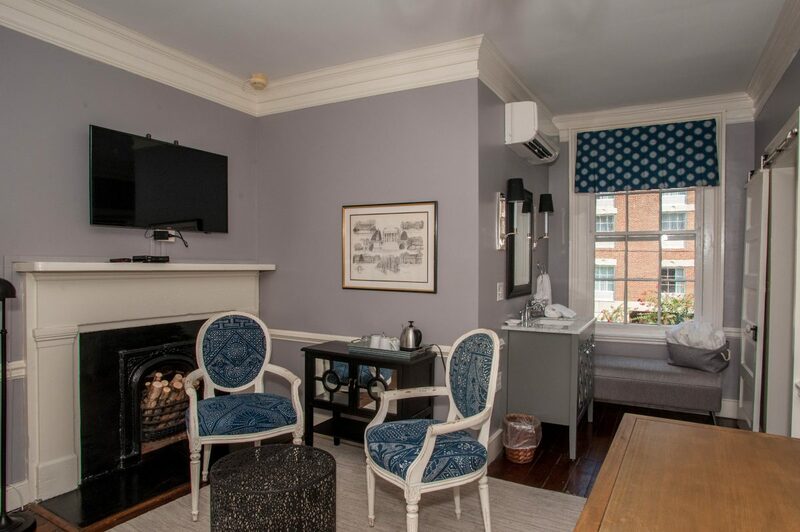 Note: While six of the nine guestrooms have fireplaces, they are historic coal-burning fireboxes and are not operational. 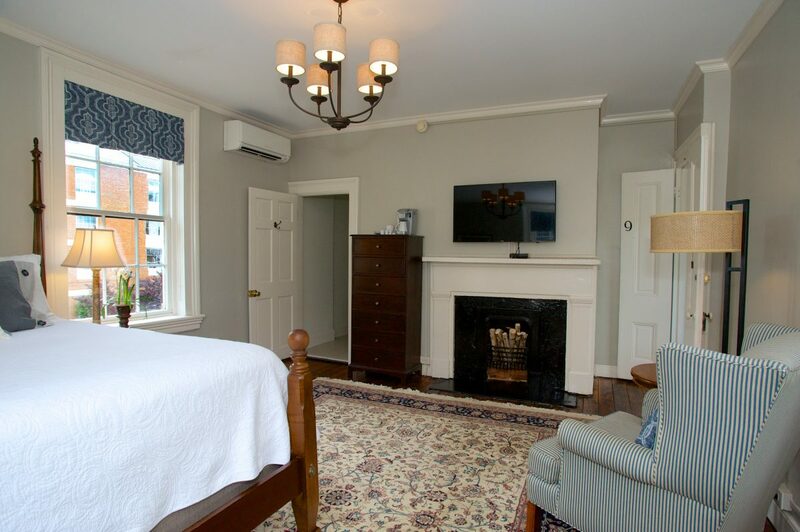 We named this room (and the Inn) after Thomas Jefferson’s master carpenter, James Dinsmore, who designed and built this Charlottesville home. 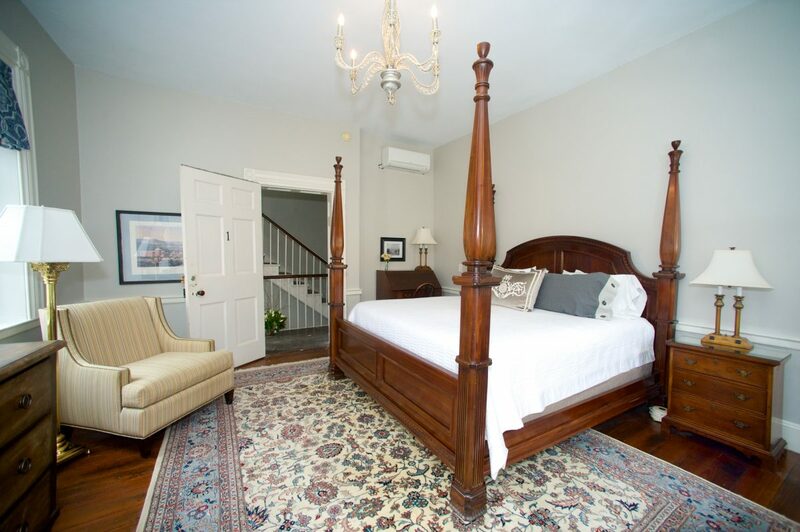 The room is located on the second floor of the house, facing Main St. 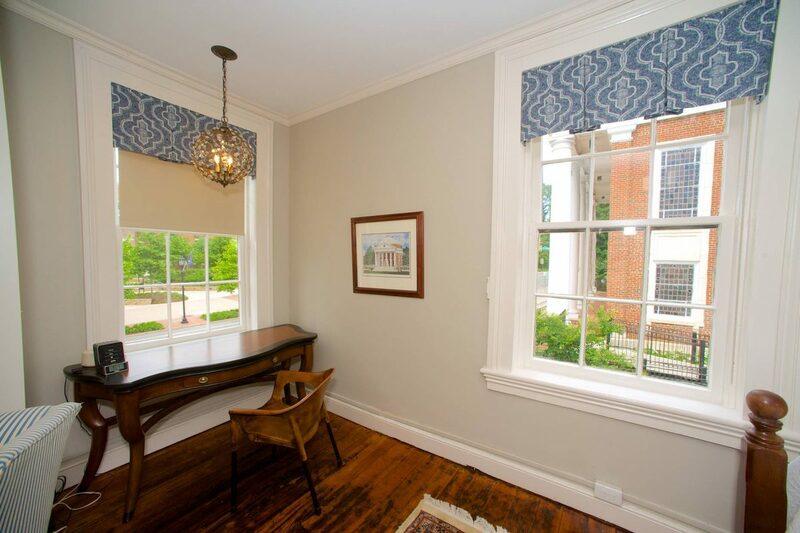 There are four large windows across the front of the room, providing ample natural light. 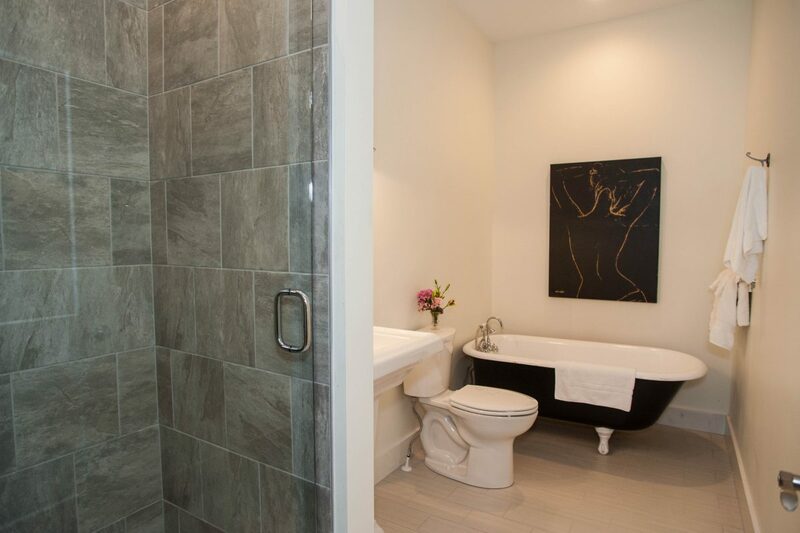 The room has a sitting area and a claw-foot soaking tub with separate shower in the private bathroom. 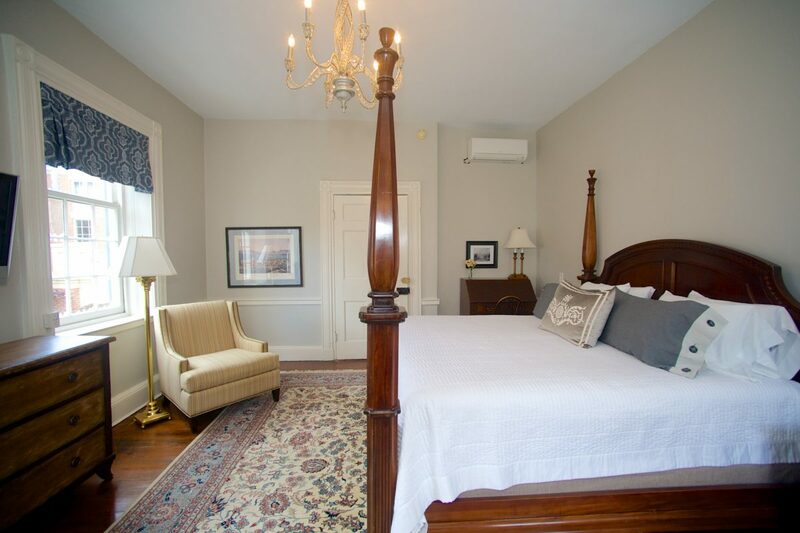 The Dinsmore Room was the original master bedroom when the home was built as a private residence in 1817. 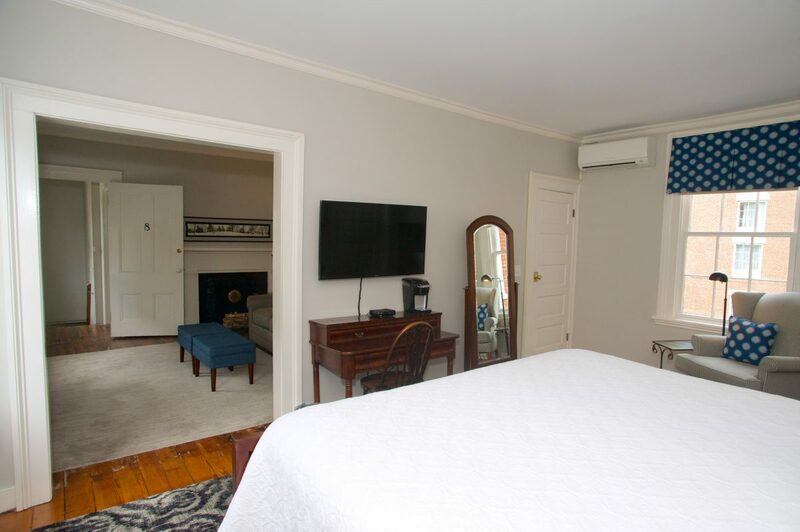 The room also connects (through a privacy double-door) to the Jefferson Suite. 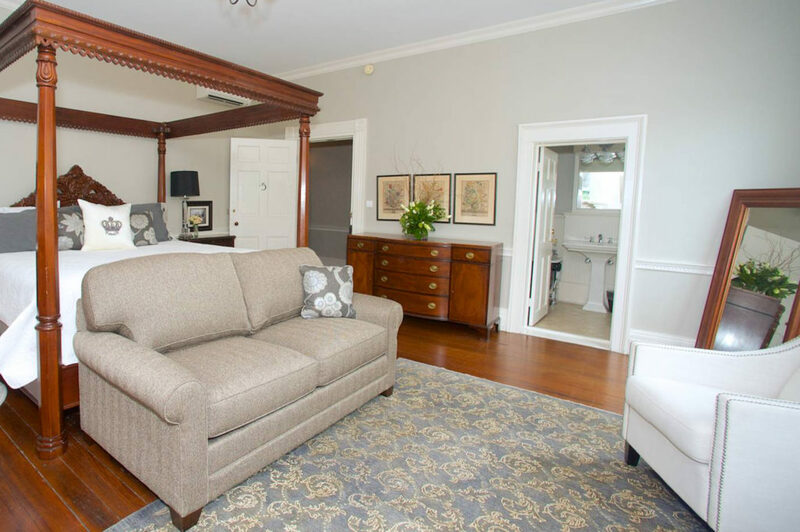 Often when families are traveling together, they reserve both the Dinsmore Room and Jefferson Suite, and then unlock the double doors to create a roomy apartment. 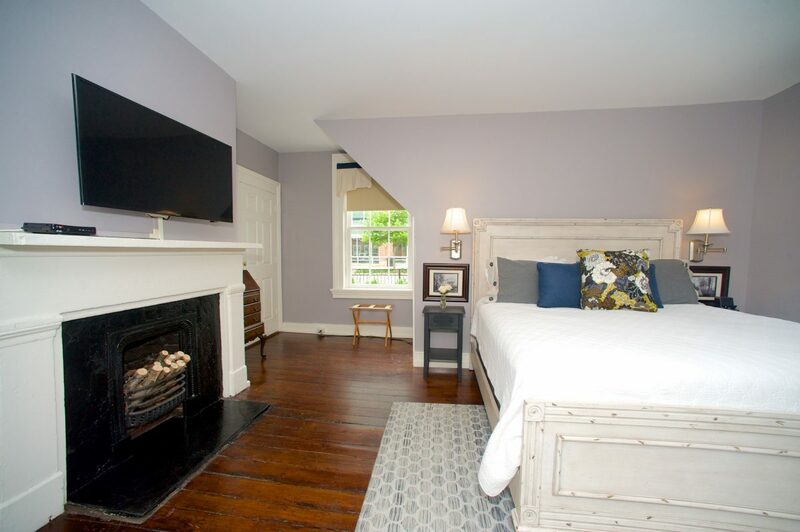 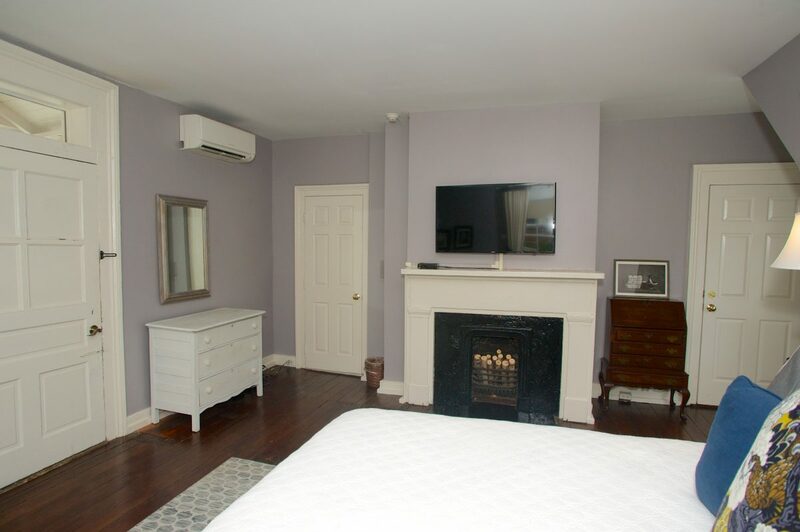 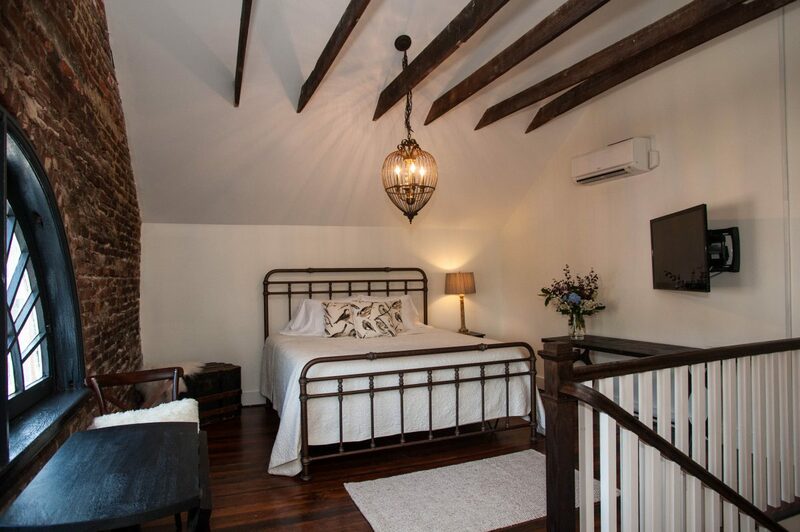 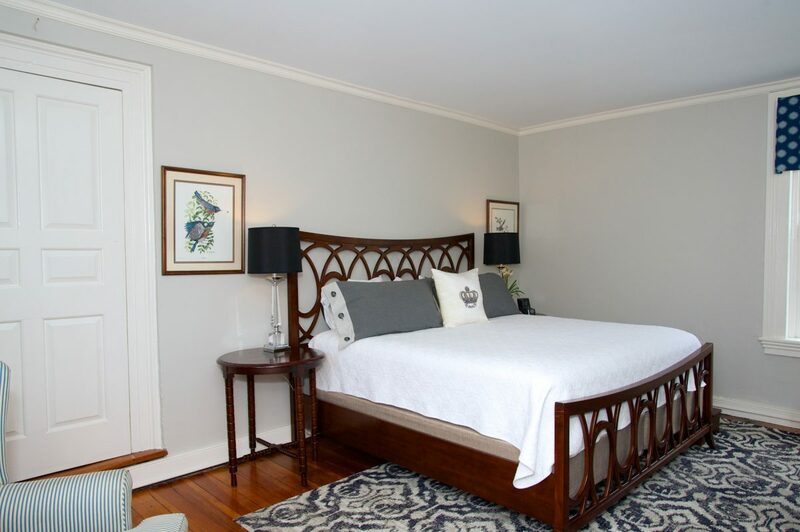 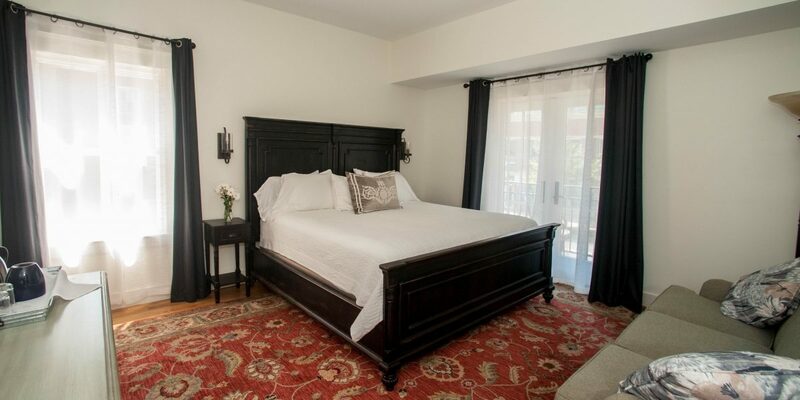 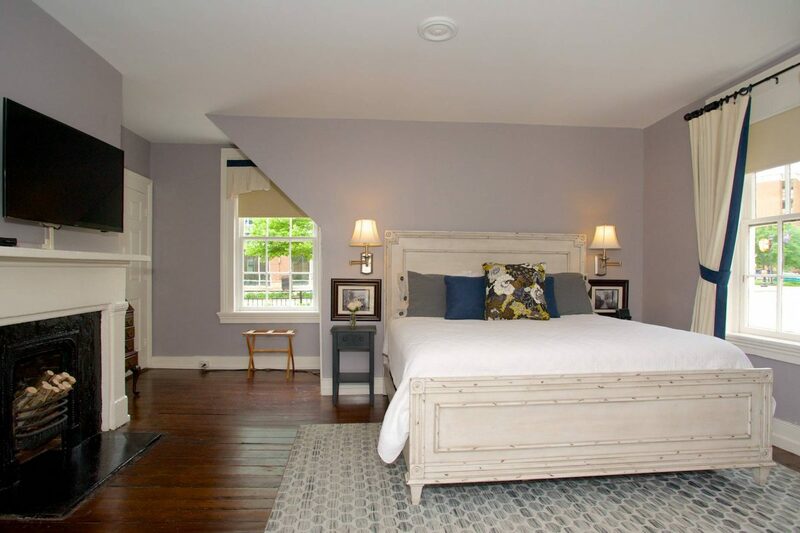 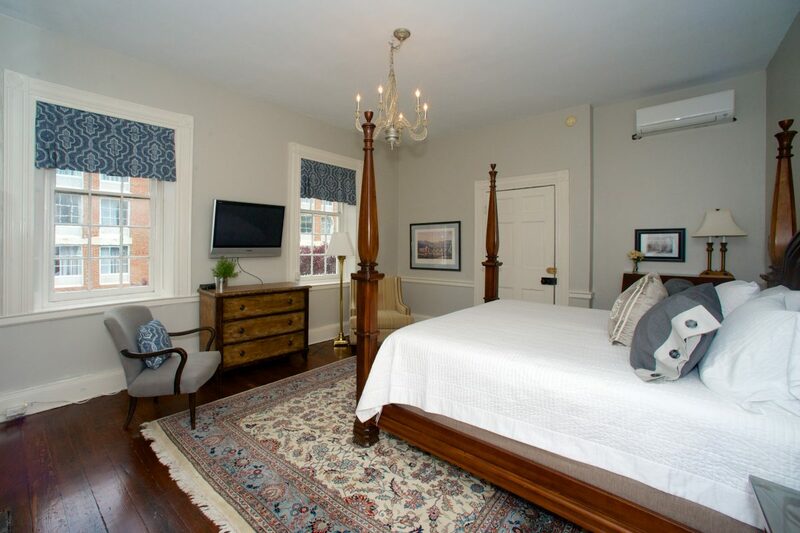 This suite features a king-size bed in the attic loft, above the second floor sitting room and full bath. 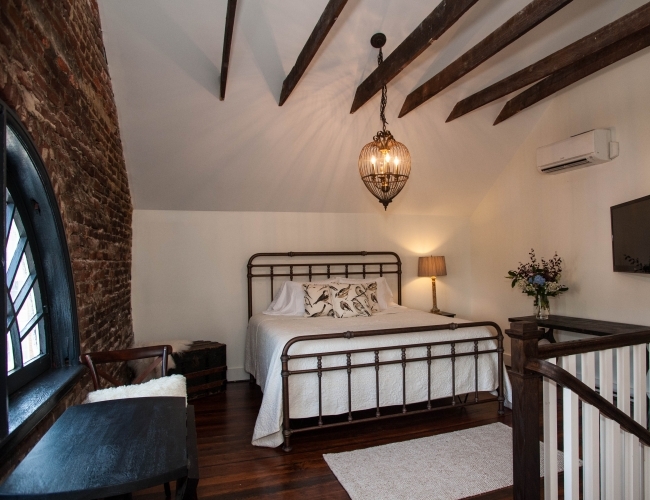 We added an ensuite private staircase to the room, so that guests can access the vaulted-ceiling, exposed brick loft bedroom, which also has a second half bathroom upstairs. 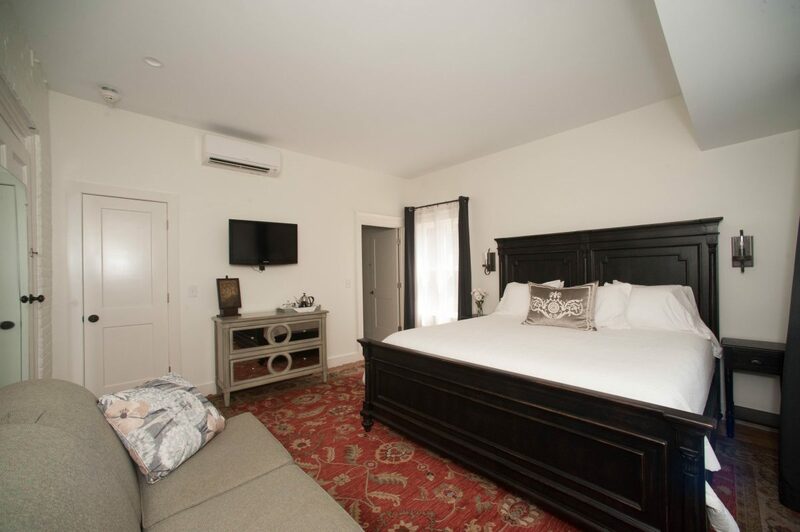 This suite has a sitting room and full bath on the second floor, and a vaulted ceiling king bed and half bath on the third floor. 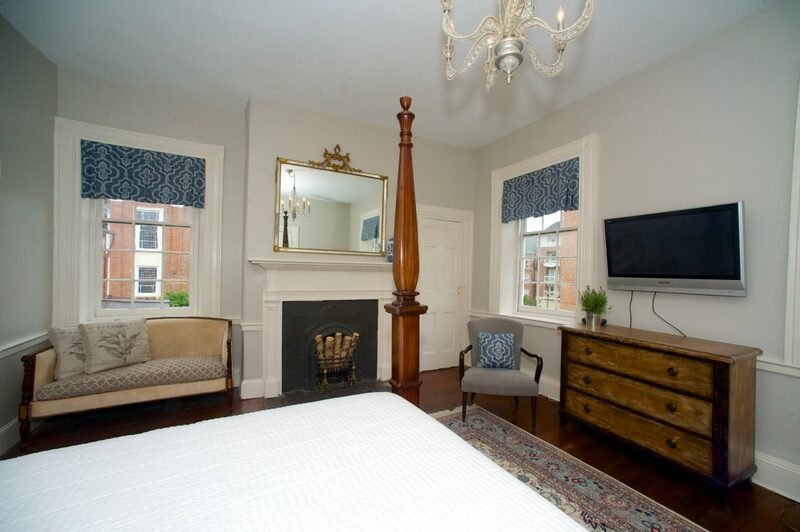 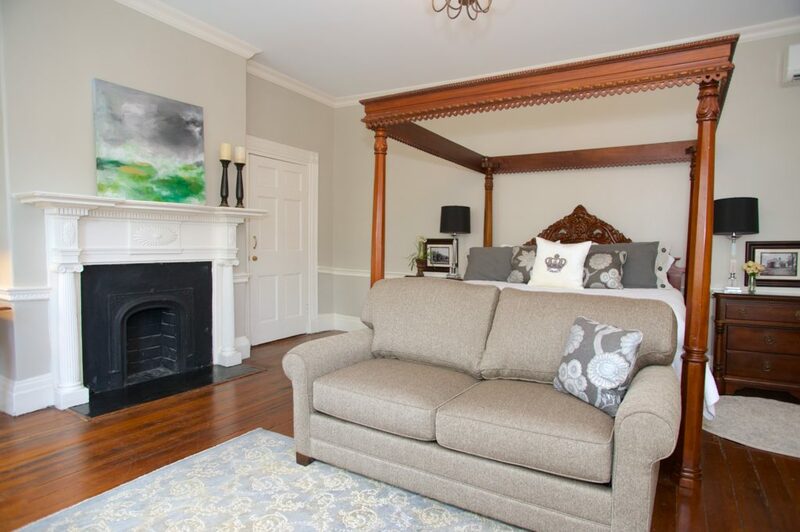 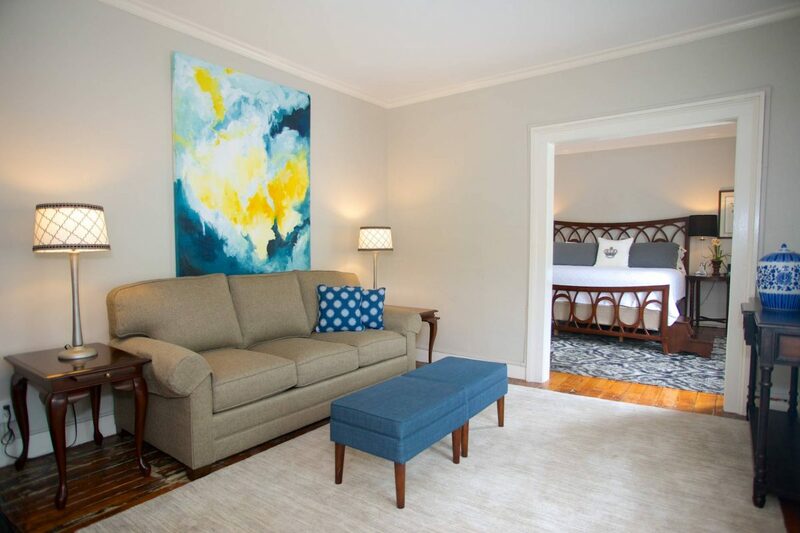 Located on the 2nd floor of the adjoining townhouse, Thomas Jefferson himself would appreciate this relaxing suite. 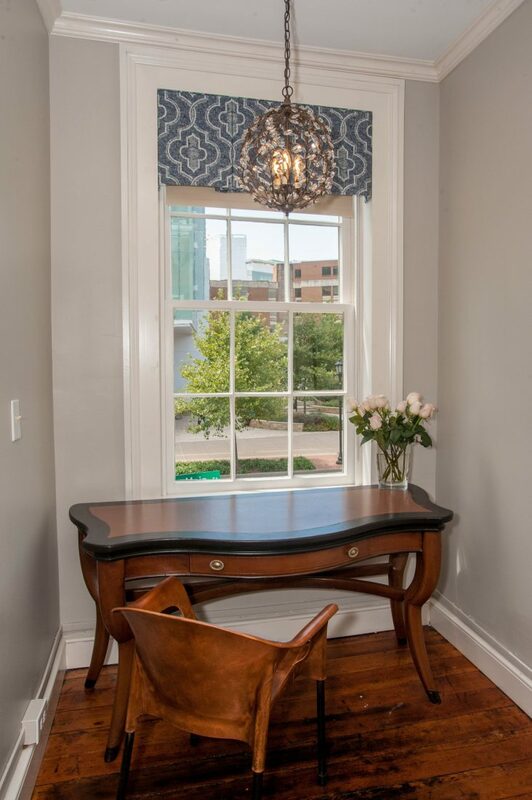 The sitting room was designed with comfort in mind, providing a perfect place to read a book or share conversation with friends. 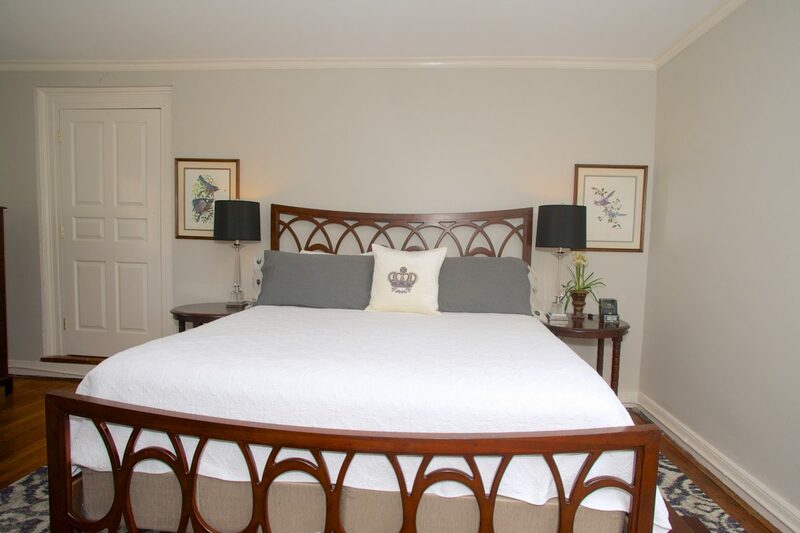 The bedroom features an inviting king-size bed. 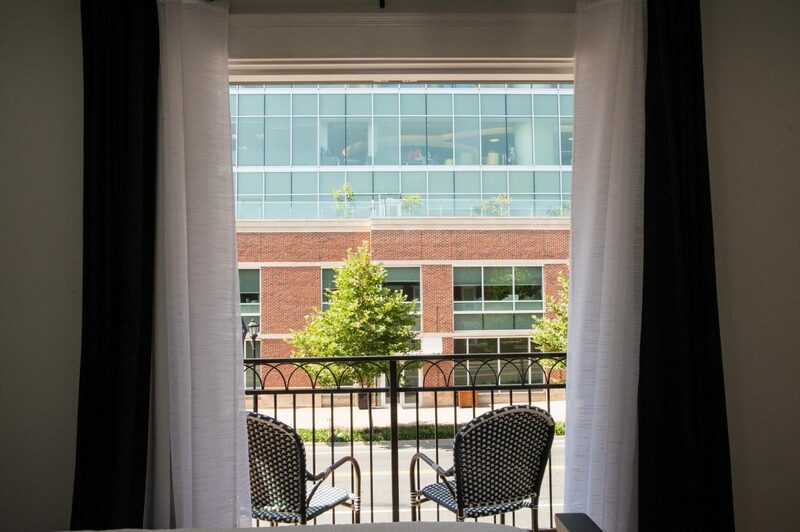 Choose one of the four windows to view main street or our charming courtyard. 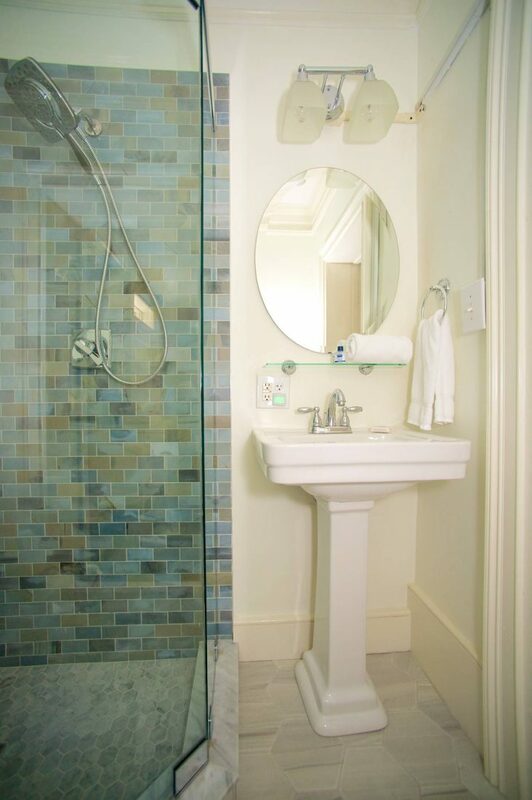 The room’s private, shower-only bathroom rounds out this room’s trio of spaces. 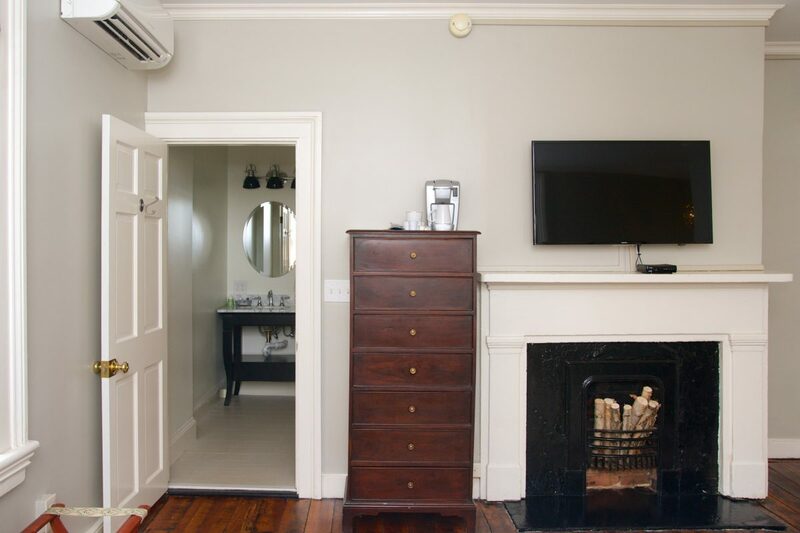 Traveling with a child or third guest? 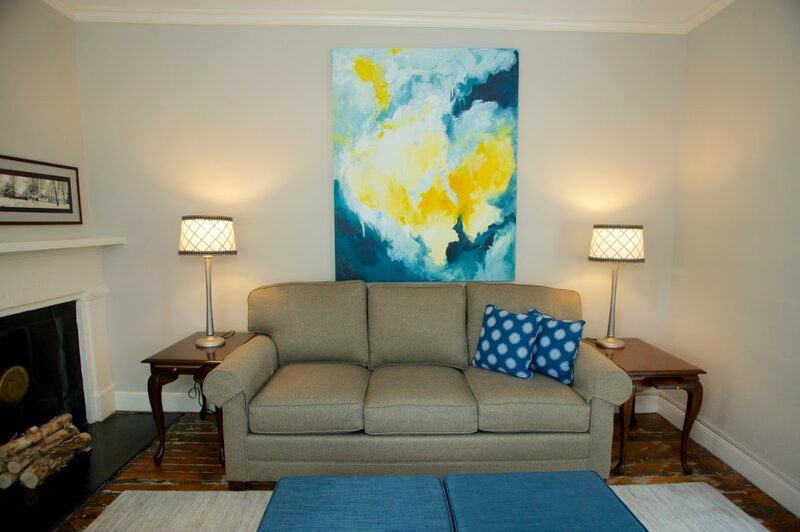 Pull out the sofa bed for an extra sleeping surface. 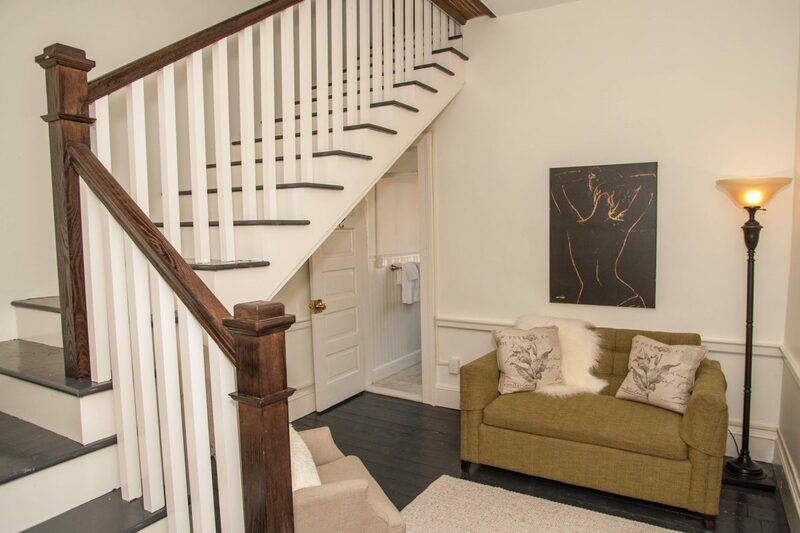 Note: There is a single flight of steep stairs up to this room. 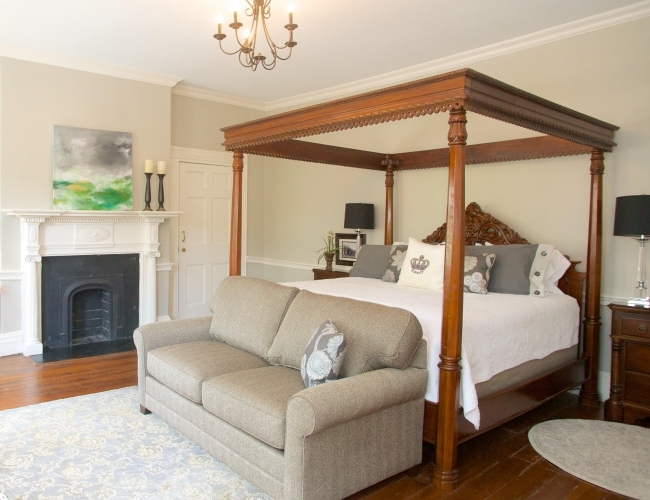 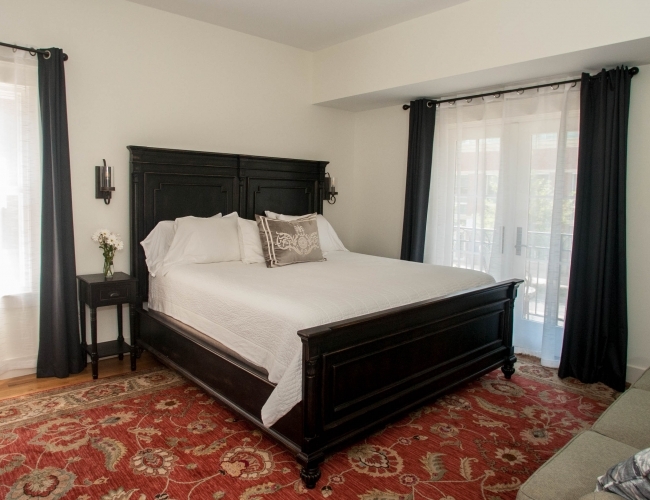 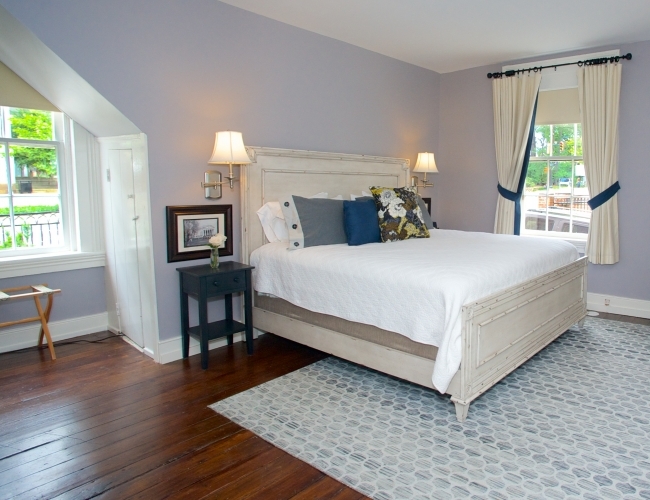 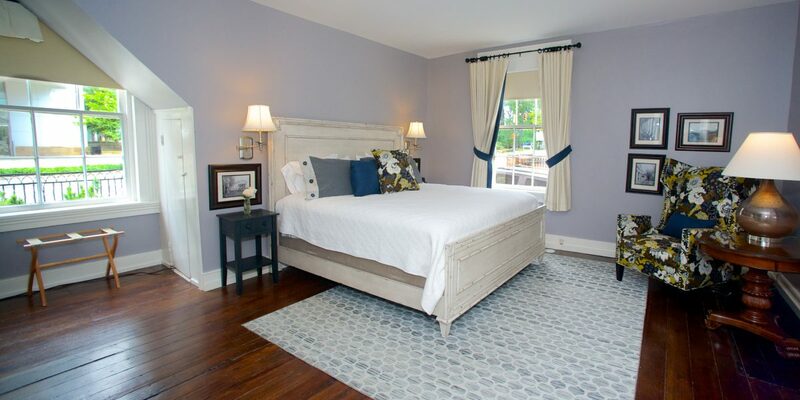 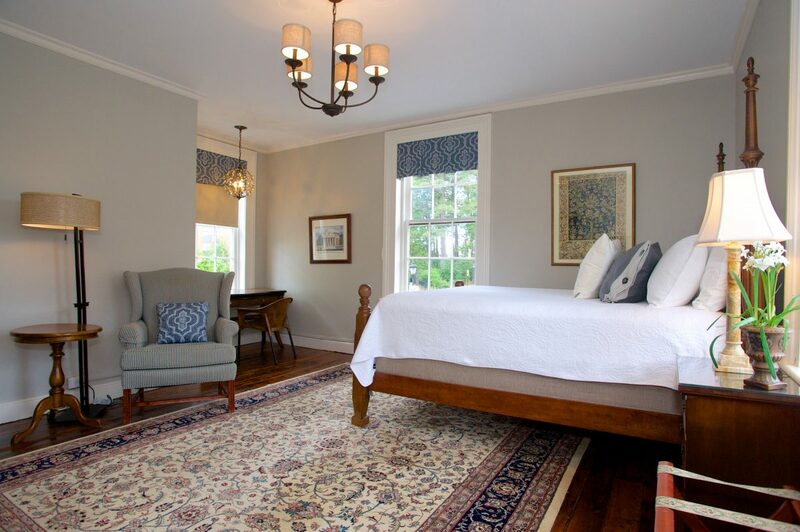 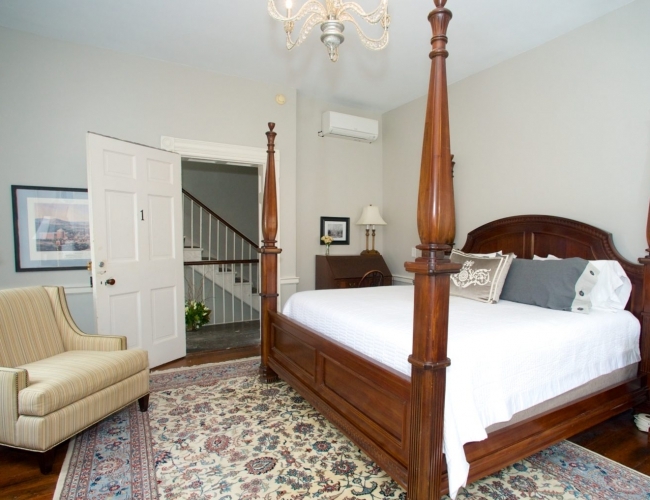 Enjoy bright, airy luxury in The Madison Room at our Shenandoah Valley area bed and breakfast. 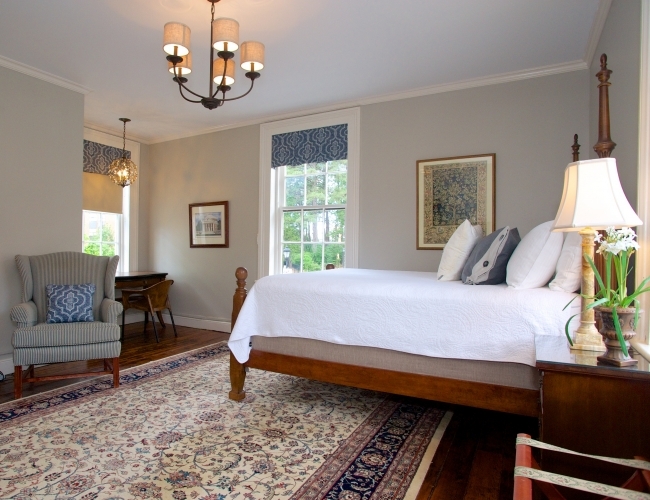 Decorated in a colonial-blue paint, this room is large, bright and airy. 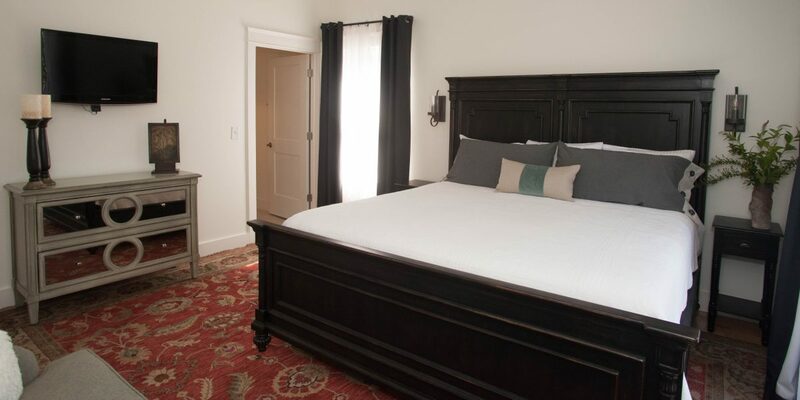 The king-size, four-poster bed is welcoming and plush, while the private bathroom has a recently upgraded tile shower. 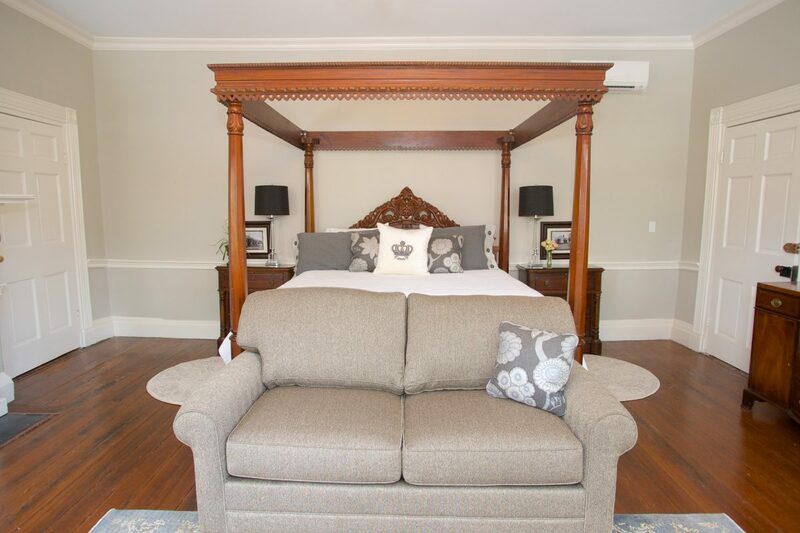 Relax in the room’s two armchairs, perfect for reading, conversation or watching a movie on a quiet evening. 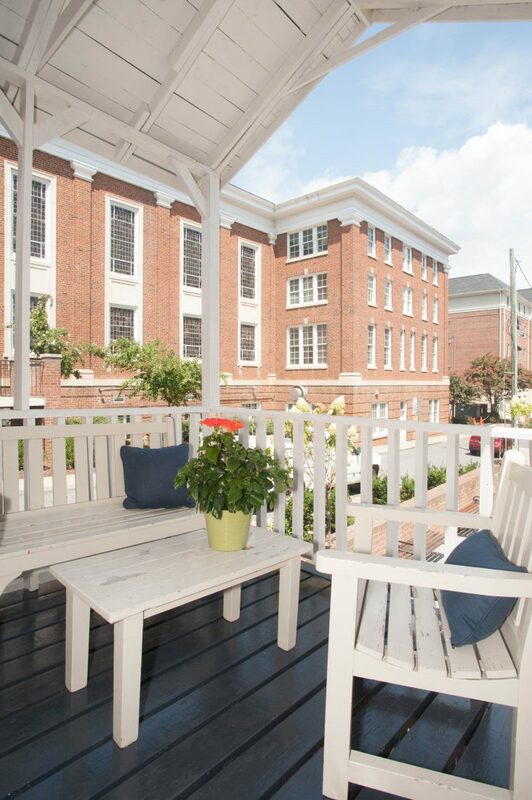 The Madison is located at the rear of the building, on the 2nd floor of the Main House. 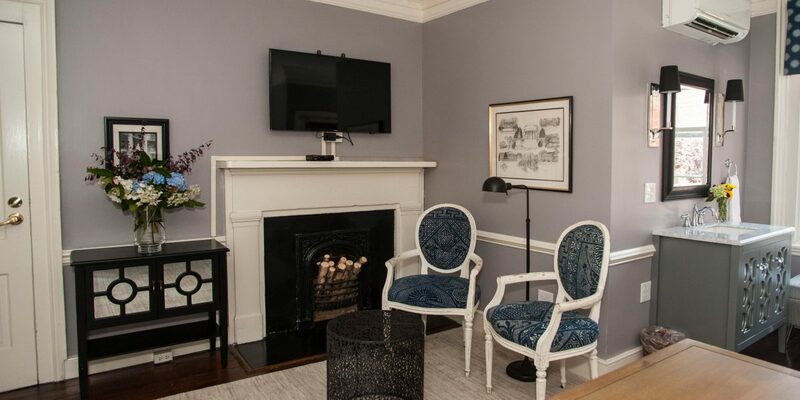 Situated at the top of the stairs, guests in the Madison Room are the first to smell breakfast or cookies baking so you’ll know when to come down to the morning meal and the evening snack. 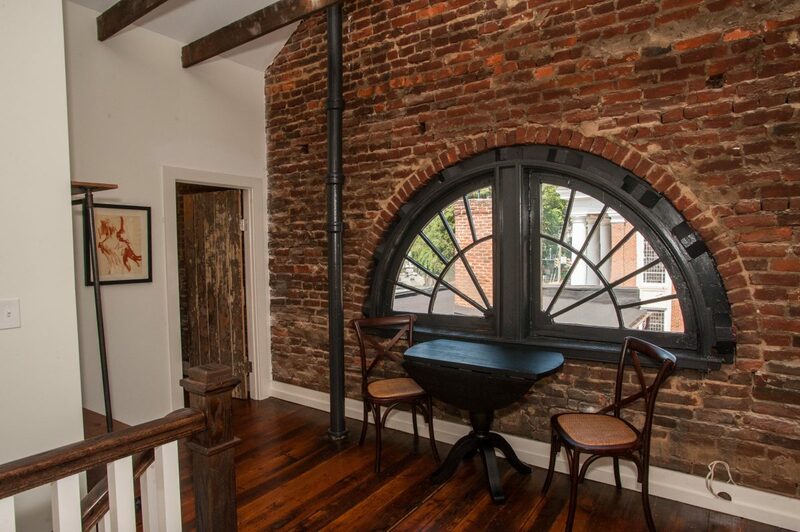 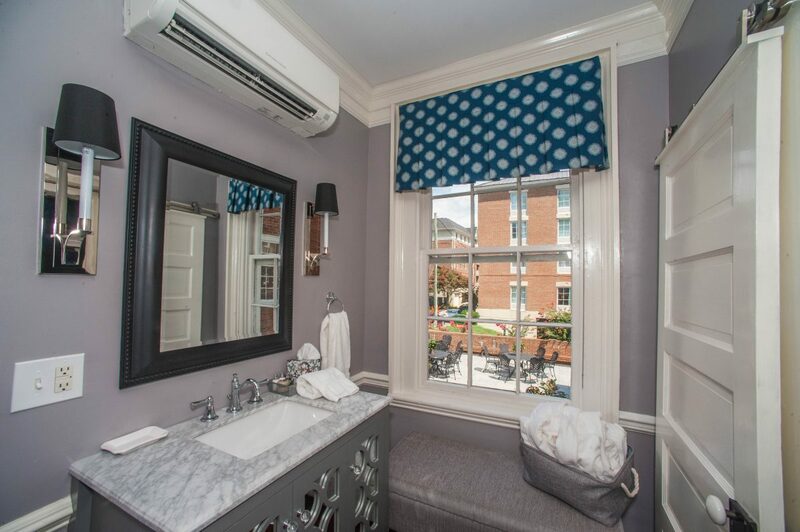 Located on the first floor of the adjoining townhouse, the Virginia room has a private entrance separate from the main house: directly off Main Street with a back window that overlooks our charming courtyard. 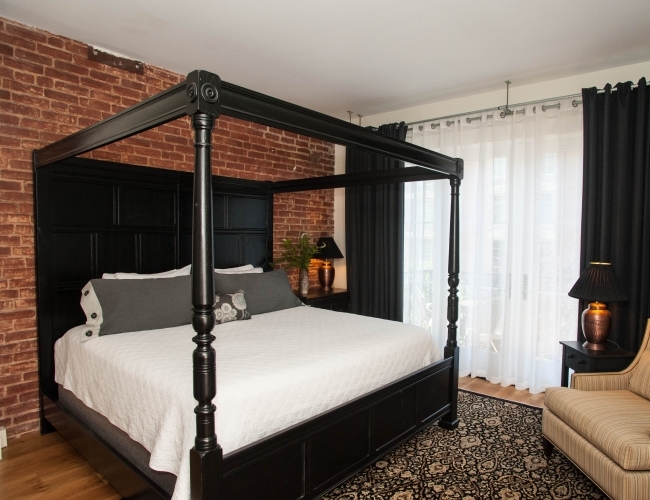 The room features an antique king-size, canopy bed. 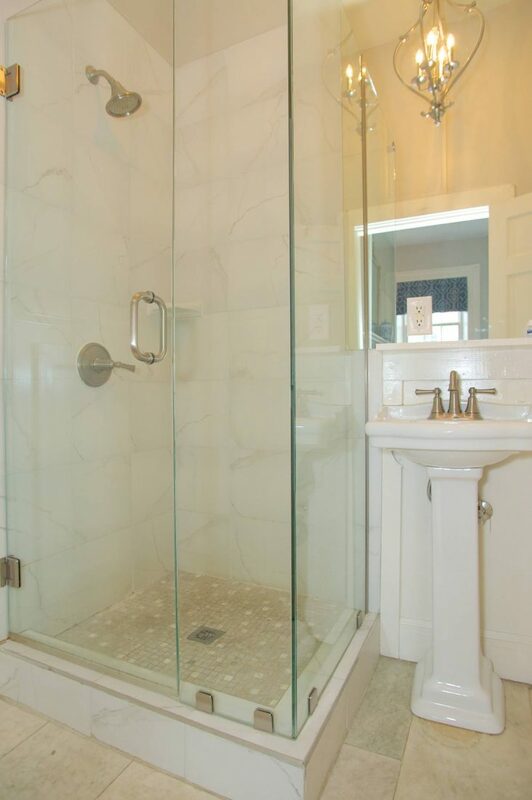 The large tiled shower has a rain head. 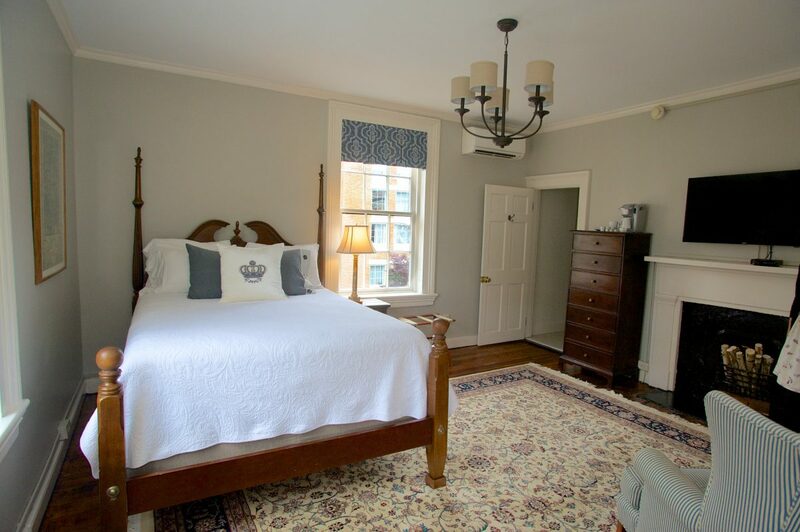 A second floor room in the main building, this is a new guest room added during the 2017 inn remodel. 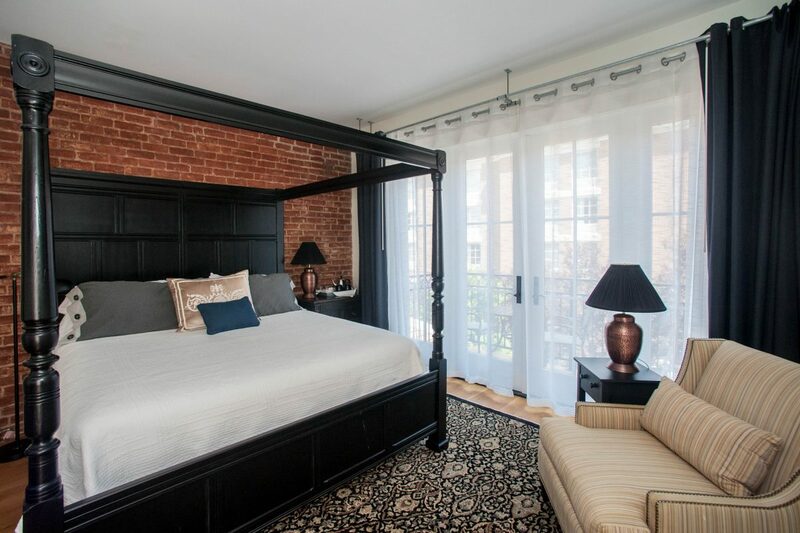 The room has a king-sized bed, and a balcony facing the rear of the building. 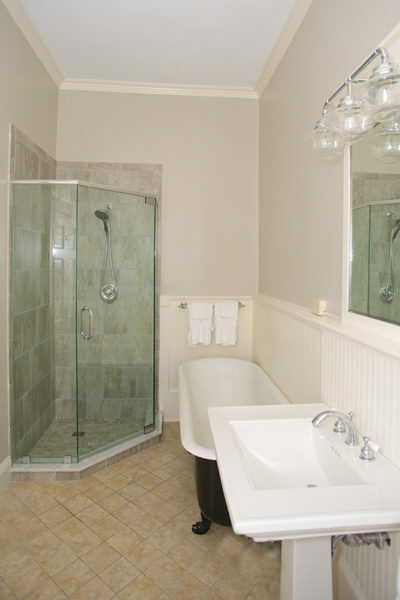 The large bathroom has a clawfoot soaking tub and a tiled shower. 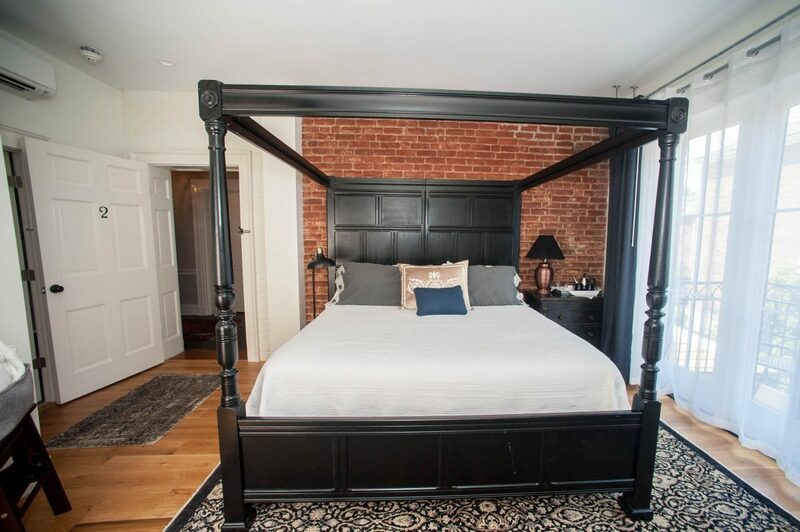 This newly added guest room has a king bed, private balcony and clawfoot soaking tub in the bathroom. 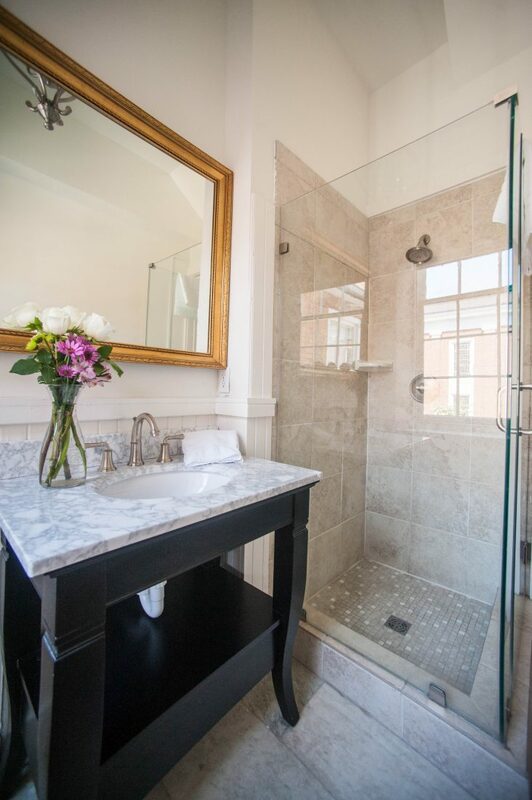 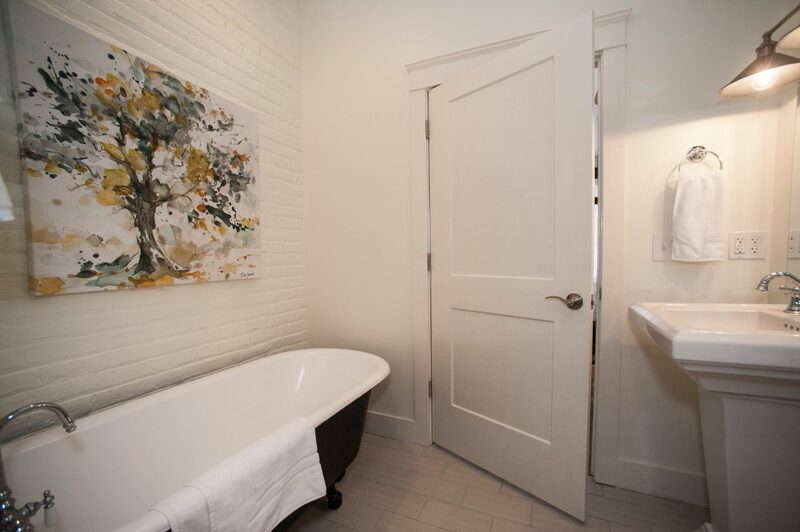 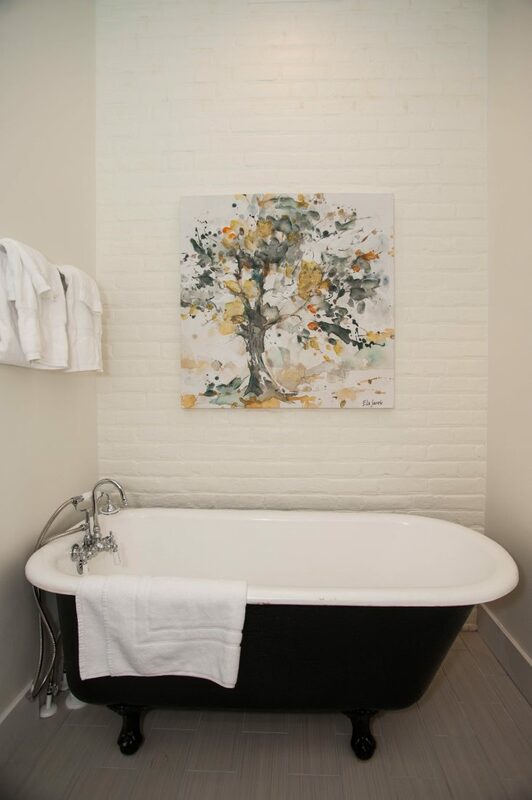 Located on the second floor of the main building, this room features a large bathroom with clawfoot tub and tiled shower, and a private balcony overlooking Main Street. 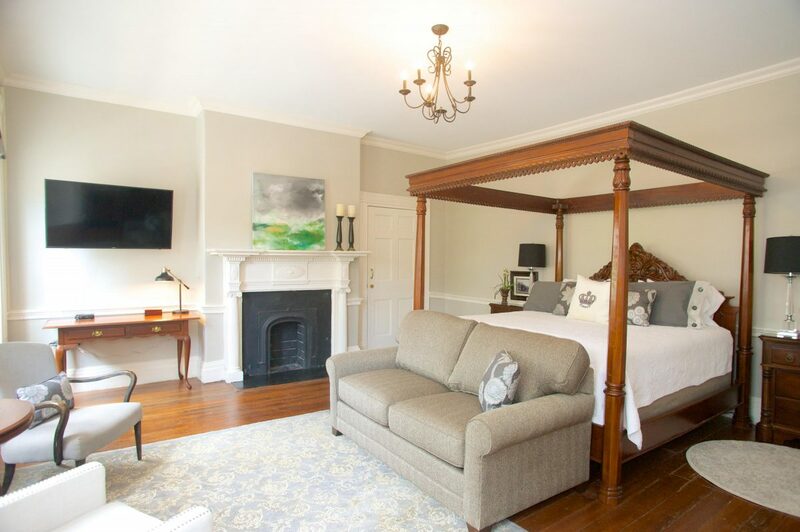 The Monroe is one of the most private rooms in the inn, making it popular for honeymooners and those wanting an especially romantic getaway. 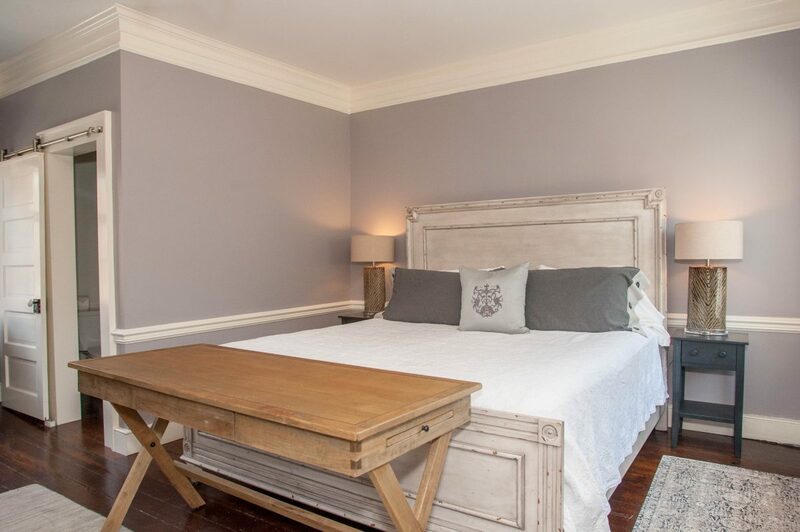 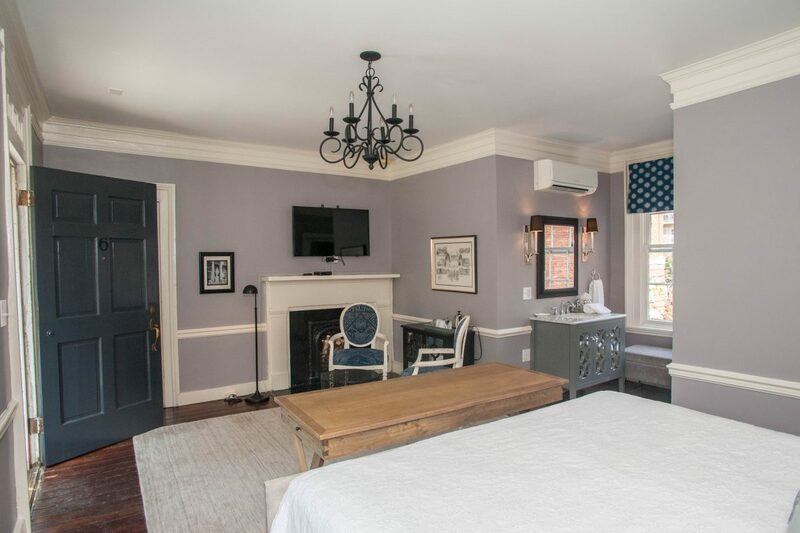 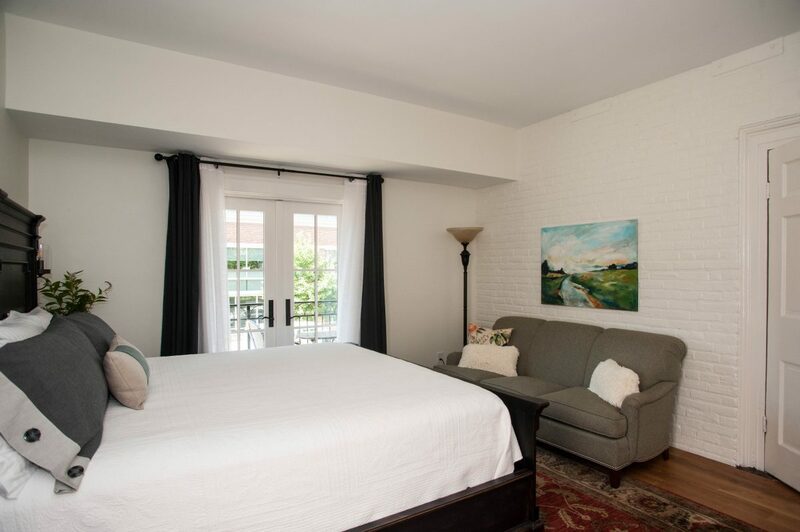 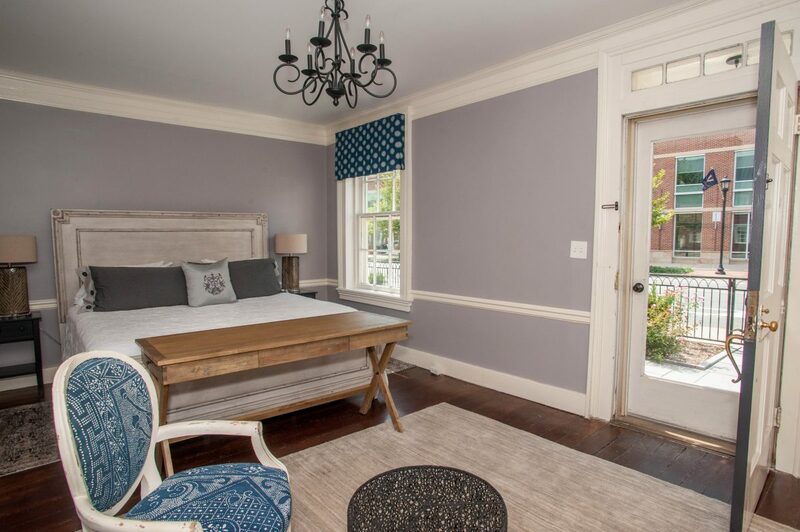 Located on the adjoining townhouse’s second floor of the adjoining townhouse, this room provides a true Charlottesville feel, overlooking the church next door and our courtyard. 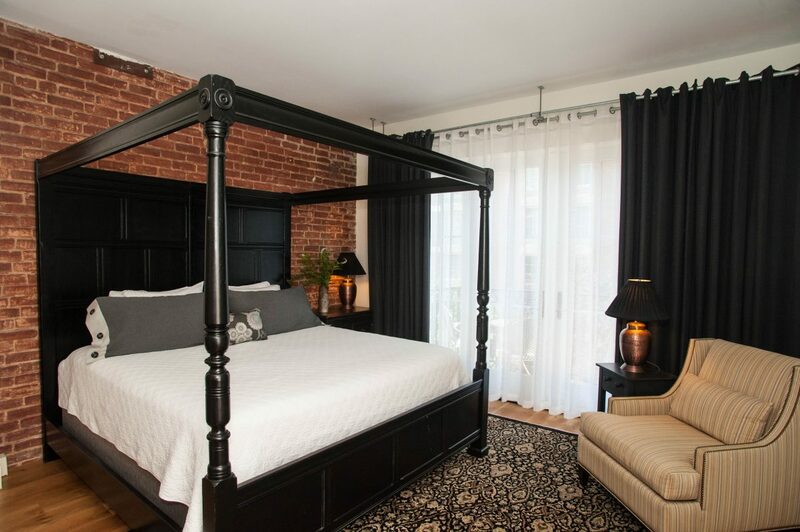 The Monroe Room has a king bed and a large closet, with glass-paned entry doors. 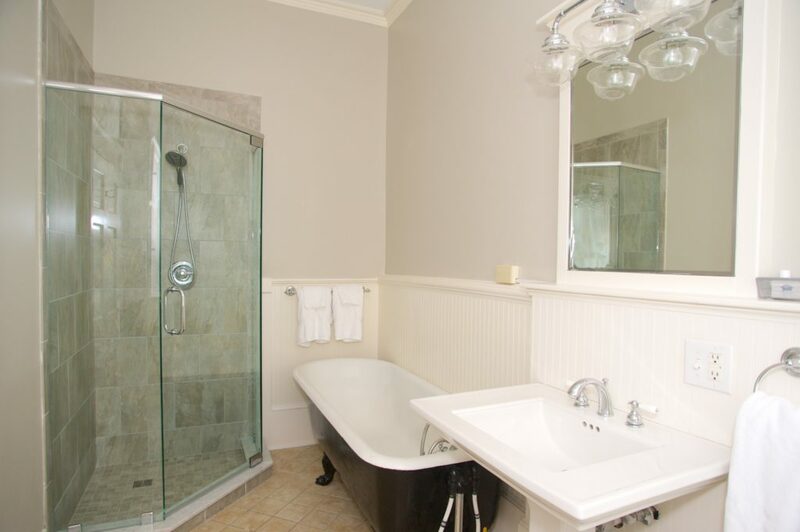 The private bathroom has a shower. 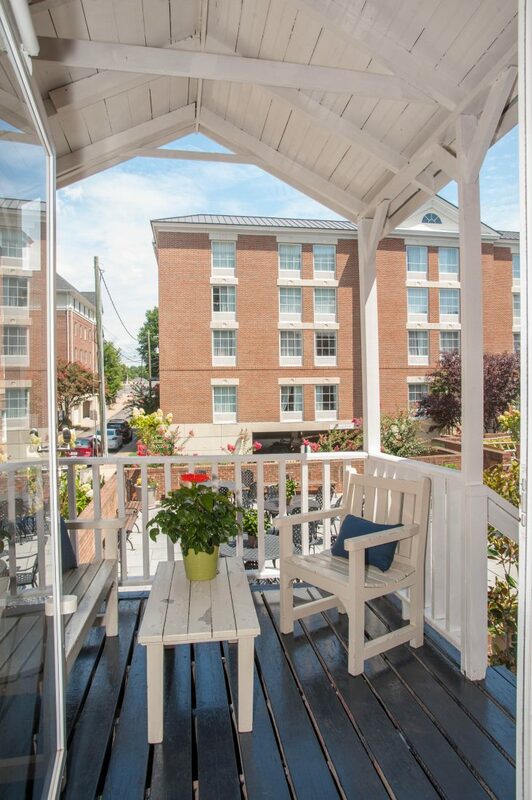 True to its name, the Veranda room features a walk-out veranda that overlooks the courtyard, which is a favorite place for afternoon reading or evening conversation. 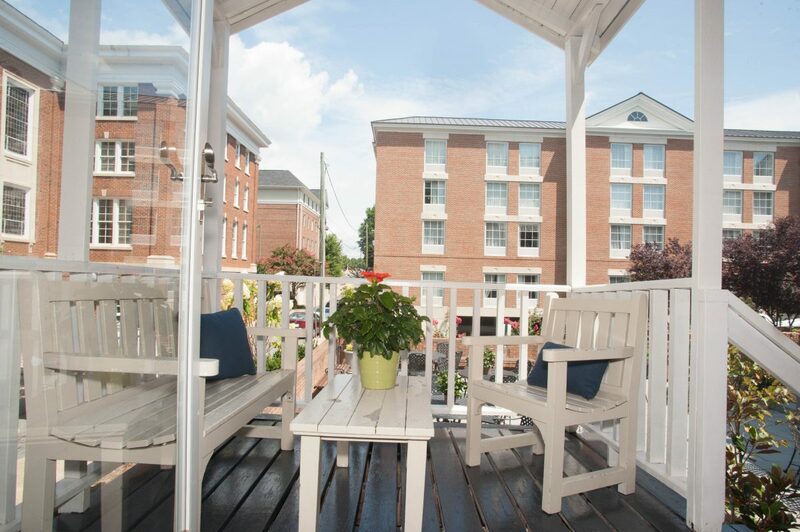 Weather permitting, guests can enjoy a private breakfast on the porch (please contact the innkeepers in advance of your stay if you’d like to book a Veranda breakfast). 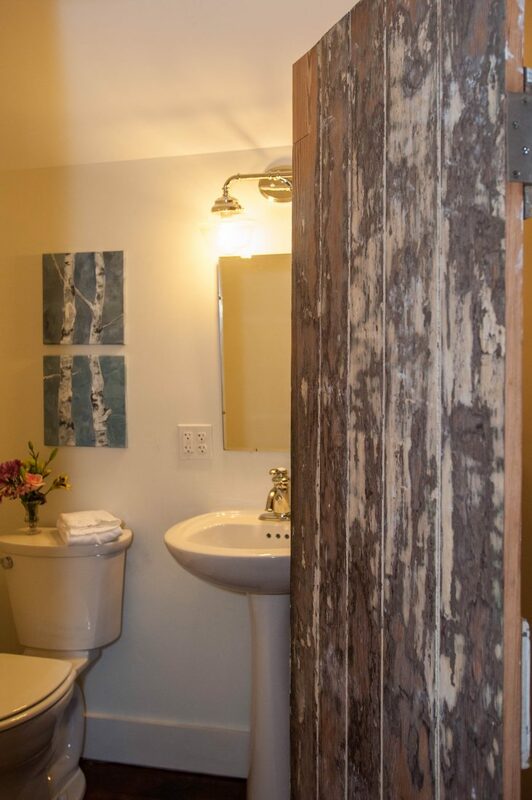 The private, shower-only bathroom is just steps away from the bed.